This video shows the demo of how to use the speed radar gun to measure the bowling speed of a bowler. This demo video is made by the help of Pankaj Kumar, who is a fast bowler of crickethighlights.com cricket team. Danish Ahmad Khan who is the chief operating officer of crickethighlights.com and Sudhir kumar who is a professional photographer. The ball used in this demo is white cricket ball, and the training camp is in A.N college, Patna. As you can see in the clip, that speed radar gun is very easy to use. One just have to point the gun to the object moving and press the trigger, and when the trigger is released then the gun display the fast speed of the moving object. One has to keep in mind the timing of the release of the trigger of speed radar gun. Good job folks – hope this helps young bowlers understand where they are compared to international players and work hard to match them. perhap ist time such extra-ordinary high tech mechanism Demo have been initiated in Bihar. Cricket highlights .com,has done a great job for young cricketers indeed. 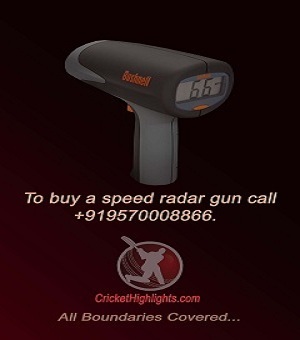 Radar Gun Demo by cricket highlights .com,is doing unique efforts to boost the cricket play in Bihar,this attempt must be recognised by cricket lovers in worl-wide. excelent mechanism of radar Gun presented by Danish Ahmad Khan on behalf of cricket highlits .com at A N College,Patna,Bihar is much behind in quality cricket game,by help of Radar Gun Young players wuold improve their bowling speed. this type of Demo is most essentila for improvement of cricket game in bihar.